The Lumberyard has been around for over 40 years in one way or another. We have been under one roof but have a rich history of being Anderson Lumber, Stock Building Supply, White Mountain Lumber and now The Lumberyard. White Mountain Lumber was originally established in 1990 as White Mountain Lumber and Rental, a local business in Green River, Wyoming. Here is a picture of our 1st store as White Mountain Lumber. 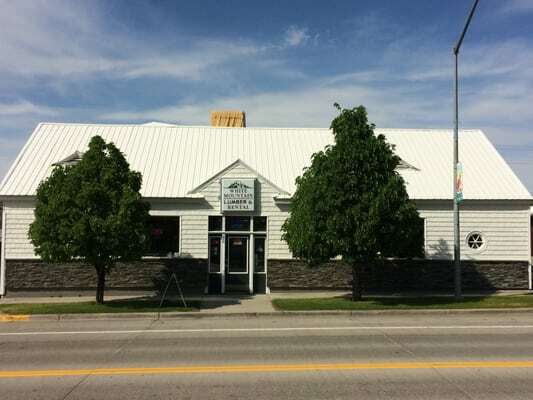 We moved in to Evanston, Wyoming in 2009 under the umbrella White Mountain Lumber. Then in 2016 we were able to transition into what we are today, The Lumberyard. Our logo represents who we are going forward. You'll notice we are called The Lumberyard. We found so many people who come into our store refer to us as the lumberyard already so we thought why fight it and we adopted it as our name. We have 2 of the 3 little pigs in our logo because we are a lumber and hardware store but also a feed store. There is a connection between the lumber/hardware and feed and that is hard work. This is what the pigs are trying to tell us by leaving their lazy friend out. We work hard to make your shopping experience fantastic! Sunday - 9:00 a.m. to 3:00 p.m.
Saturday - 9:00 a.m. to 5:00 p.m.
Sunday - 9:30 a.m. to 3:00 p.m.
We are proud of our history and commit to have a long and prosperous future with you as our customer.